If you ask marketers outside of the ecommerce world, Pinterest still has a lot of work to do to prove itself as a viable social media network. 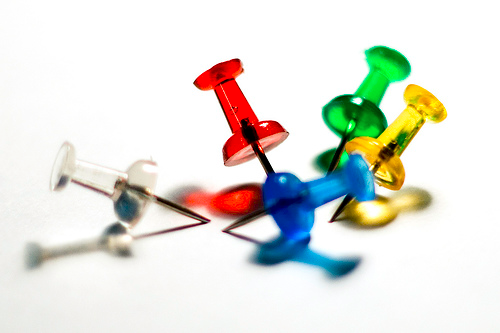 Sure, you may have drooled over Pinterest's astonishingly high conversion rate, but when it comes to actually start pinning for your brand, you still write the network off as nothing more than recipes and retail therapy. It's just not right for your industry, and besides, Facebook and Twitter are all the social media your business needs, right? Not necessarily. If you're ignoring Pinterest in your social media strategy, you're ignoring one of the key trends in marketing today: visual content. We don't mean to brag, but our Pinterest conversion rate is a whopping 15% -- and we sell software! How "boring," right? Well being a part of a "boring" industry doesn't have to limit your participation on visual social networks. So without further ado, we present to you businesses from seven non-retail, non-hairdresser, non-cooking (you get the point) industries that have found a way to get creative and get started on Pinterest. Remember Memorial Hermann, the hospital in Texas that completed the first live-tweeted open heart and brain surgeries? They kept it going by putting the surgery photos on their Pinterest account on boards bearing the hashtags as their names. (Note: We linked to this one instead of grabbing a screenshot in case you didn't come prepared to see human organs on the HubSpot blog today.) The point here is that they realized the huge audience following their surgeries on Twitter probably contained people who would be interested in the visuals, too. The takeaway here is that the marketing teams at these hospitals found a way to capitalize on Pinterest's core demographic that worked for their business -- these marketing teams probably knew that 80% of Pinterest users are women (comScore), and that 30% of those women are between 25-34 (Ignite). Within that demographic, it's pretty common to have children. And what's incredibly important to people raising a family? Healthcare. 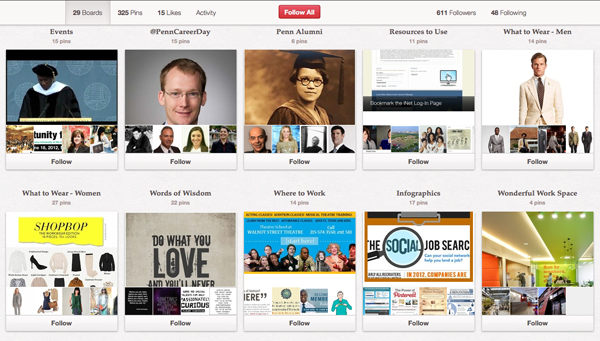 Many B2B marketers are still convinced that Pinterest is only meant for their B2C counterparts. But that's simply not true! It's so not true, in fact, that we wrote an entire guide to using Pinterest specifically for B2B businesses. 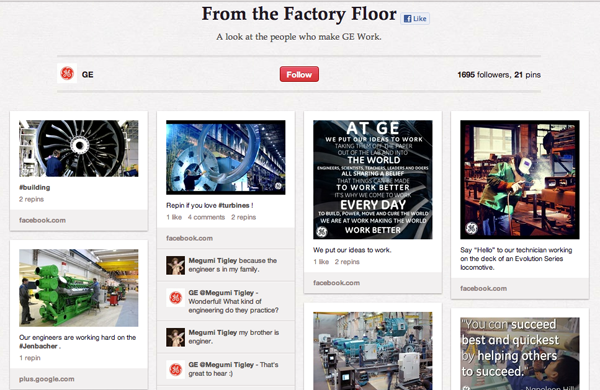 General Electric, a manufacturing & engineering company unequivocally killing it on all kinds of social networks, is unsurprisingly an example of excellent Pinterest marketing in a B2B industry. They've got their boards that seem like pin-bait, sure, ("All in Good Food" features some tantalizingly tasty recipes) but it just so happens that those boards -- visit "FABULOUS Kitchens!" and "Go for the Grill!" for examples -- are actually displays of appliances and equipment that GE manufactures. Other boards, such as "Lighting the World" and "On the Factory Floor" (shown below) showcase manufacturing in action and execution, and the results are more aesthetically pleasing than you might expect. Another manufacturing brand making it work on their pinboards is Honda. Honda's Pinterest account features a mix of product-centric boards ("2012 Honda Civic Tour"), boards that tie in with Honda advertising campaigns ("What's on Your Leap List?") and a really unique concept called the #Pintermission, which Honda has undertaken to set themselves apart in the social media marketing world. Basically, Honda gave some of their most active Pinterest followers cash prizes to bring some of their pins to life -- so if you're pinning beach photos, they want you to actually go to the beach! 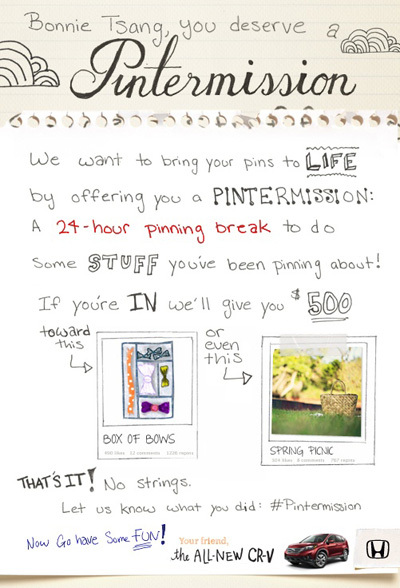 After the pinner takes their #Pintermission, Honda creates a special pinboard just to detail the follower's personal #Pintermission. It's a super sweet and personal concept that brings follower engagement to a level we haven't seen elsewhere on Pinterest. Pinterest, like any other social network, is open to innovation and ingenuity, and is not a template with predetermined categories and topics. 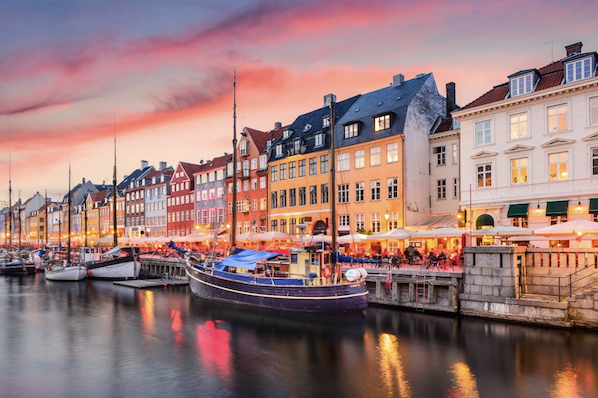 Instead of waiting for their competition to tackle Pinterest, GE and Honda took it on without hesitation, and carved out their own niches on the site that defied our expectations. On the other side of the American political spectrum, Ann Romney has become a bonafide Pinterest celebrity. The aspiring first lady made headlines as a campaign and candidate humanizer with her presence on Pinterest, a social network on which her husband does not actively campaign. Ann Romney is, if you recall from earlier, part of Pinterest's main demographic personified: a middle-aged woman with a family. 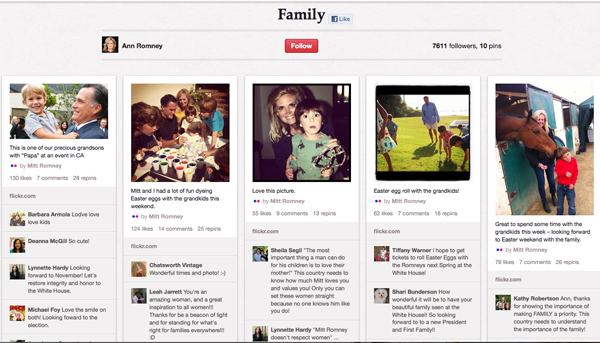 And she makes family the main focus of her Pinterest profile, dedicating an entire pinboard to photographs of her own family -- sourced mainly from Mitt Romney's official Flickr account. Institutions for higher education have to market themselves just like any other business -- what better place to market to prospective students and their parents alike than the internet? 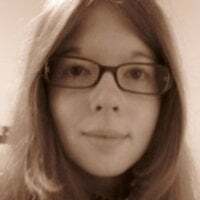 Pinterest's demographics are well suited for this, and its visual format lets colleges and universities show off their campuses, students and alumni, mascots, and anything else you can think of. Seriously, anything. 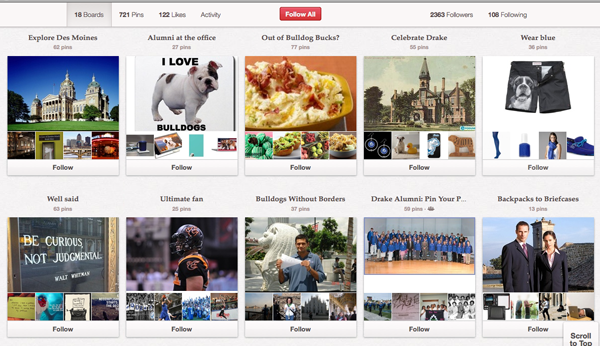 Check out Drake University's Pinterest account and you'll see what I mean. They have an "Adorbs Bulldogs" board (that we may have spent a bit too much time on while researching this post) in honor of their loveable mascot, a "Study Abroad" board featuring photographs taken by their students spending their semesters gallivanting the globe, and more. It's engaging, fun, and can easily be linked to on an admissions website for some visual proof to back up the admissions department's marketing claims. We'll concede that Windows has high visibility on its side. I mean, who doesn't know what Windows does? 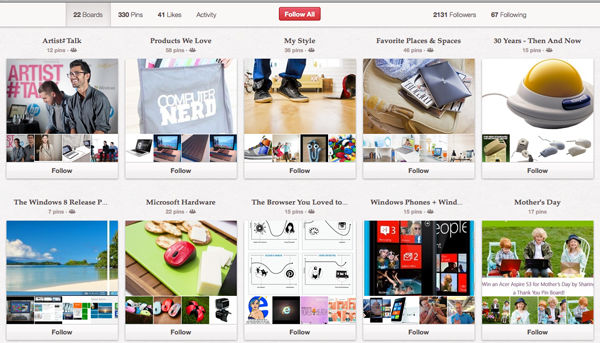 Still, that doesn't mean it's the only techie brand that can succeed on Pinterest. 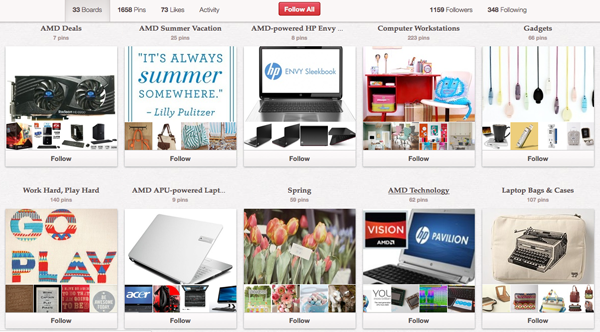 Just look at AMD's Pinterest presence. They showcase pins of AMD products, such as the HP Envy, and the things that complement technology's presence in your life, such as computer work stations. It's a really interesting way of visualizing the products, which non-techies out there probably couldn't visualize otherwise. 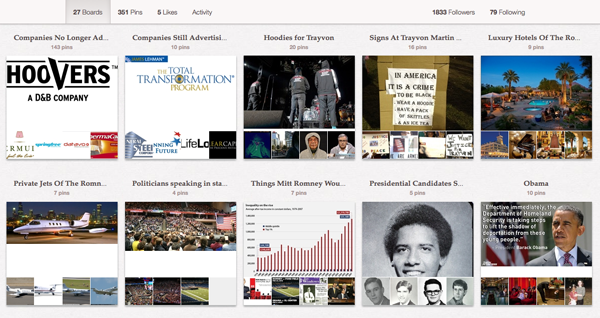 We think Pinterest could be an excellent venue for tech start-ups to show off their products, too. Just saying. Where are you guys?! We wanted to make this section Insurance and Finance, but the big banks, credit card companies, and other financial institutions are refusing to set foot onto Pinterest like their insurance counterparts. C'mon, guys! Your visual playground awaits. In the meantime, take a look at Farmers Insurance's Pinterest account to see how to play hard from the get-go. Farmers Insurance's account focuses on their appearances at charity events like the March of Dimes, on the racetrack with NASCAR, and more. 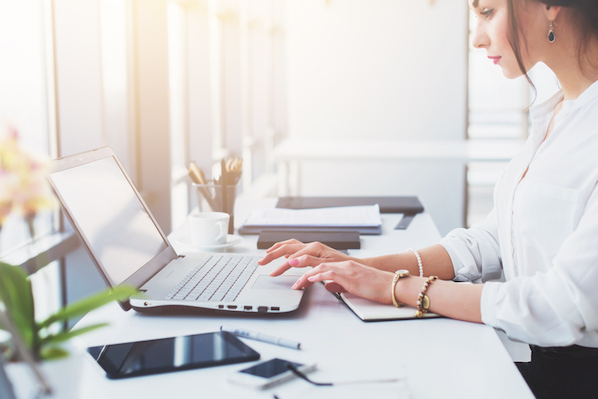 While they're still just getting started on their pinning journey, they're miles ahead of their competitors, who haven't even started -- and that, to us, is killing it. Just because we said "insurance" doesn't mean the focus has to be people. 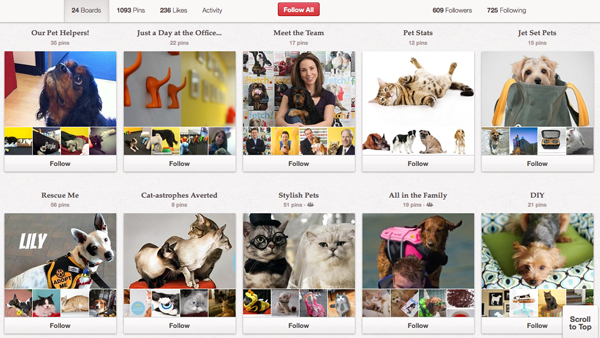 One of the most impressive insurance brands on Pinterest is PetPlan Pet Insurance. Their Pinterest account is filled with what seems at first glance to be gratuitious pin-bait photographs of adorable kitties and puppies -- but they take it one step further, too. PetPlan brands themselves as practicing what their product preaches, and they illustrate this by showcasing the pets owned by employees, the members of the PetPlan team at work, and behind the scenes snapshots of the office on their Pinterest account. They also have boards containing pet infographics, care tips, and claims to fame in which they showcase customer success stories -- and in the insurance industry, success stories mean payouts. That's right -- an insurance company openly and proudly admits to giving good payouts to its customers, instead of shielding itself behind how much its customers might save. In the world of nonprofit marketing, it's important for donors to be able see the impact of the organization -- and Pinterest is a great medium for it! UNICEF's Pinterest account does an excellent job of showcasing what the organization is all about: the people. From the celebrities who volunteer to the children who are aided with UNICEF funds or programs, their Pinterest account has boards dedicated to displaying their impact via extremely high-quality photographs. UNICEF also includes substantial amounts of text beneath their pins due to the wide range of issues their organization addresses. 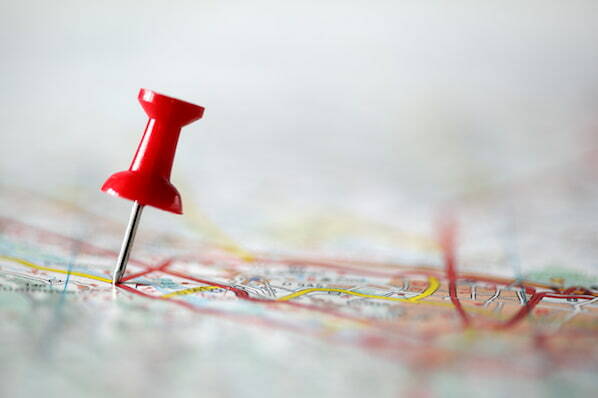 Other nonprofits don't see that as a necessary step, especially when their mission relates to one specific area. 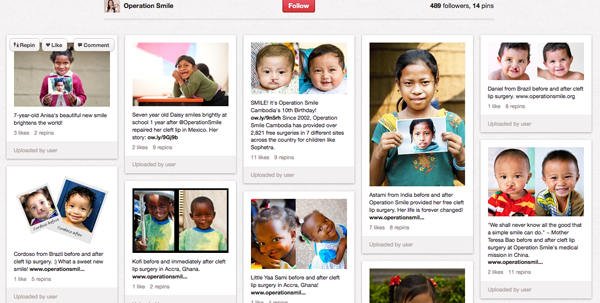 For Operation Smile, for example, this means the majority of its pins on its Pinterest account revolve around one feature: smiles. Operation Smile repairs cleft palates in children around the world, giving them a higher quality of life and beautiful smile. 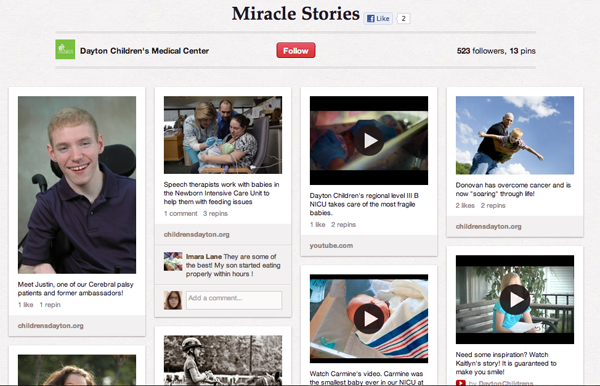 Their Pinterest account features the stories of children they've helped, before and after photographs of children afflicted with cleft palates, and a board dedicated just to videos. Operation Smile knocks it out of the park with an expert blend of mission-specific rhetoric and feel-good news. The biggest takeaway from all of these excellent Pinnovators (get it?) is that you don't have to follow the general trend of how most people are using a new social network. So don't wait for your competitors to soar past you to get started! What unlikely industries have you seen rocking it on Pinterest? How have you used Pinterest in your marketing?